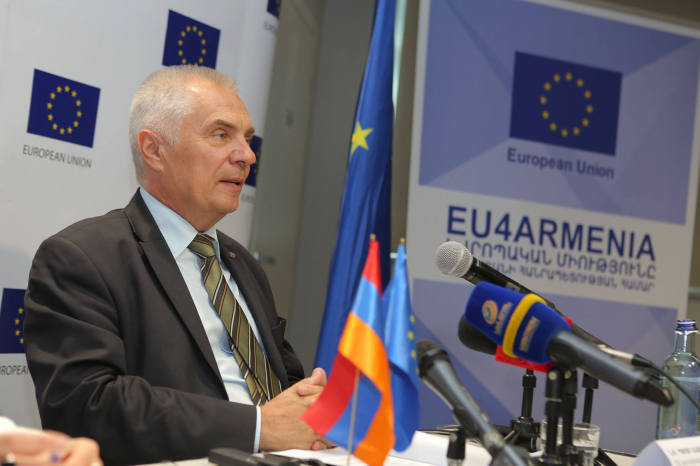 The European Union fully supports the efforts of the OSCE Minsk Group co-chairs towards a peaceful resolution of the Nagorno-Karabakh conflict, Piotr Switalski, Head of the EU Delegation to Armenia, told reporters in Yerevan. He made the remarks while commenting on the recent meeting between Azerbaijani President Ilham Aliyev and Armenian Prime Minister Nikol Pashinyan in Vienna. Switalski noted that the settlement of the Nagorno-Karabakh conflict is mediated by the OSCE Minsk Group, which successfully copes with its mission.